Antique nests of tables or also known as nesting tables are not only very versatile but also very pretty pieces of furniture to look at. 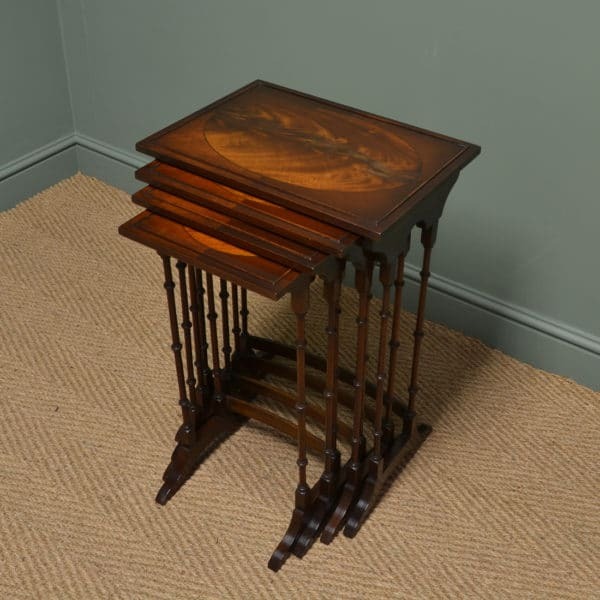 They were first illustrated by Sheraton in his Cabinet Directory of 1803 described as ‘Quartetto tables’ and stated they are useful for needlework whereas George Smith in 1808 described them as ideal for serving refreshments. They were made throughout the Victorian and Edwardian periods in three main timbers, Mahogany, Walnut and on rare occasions Rosewood. 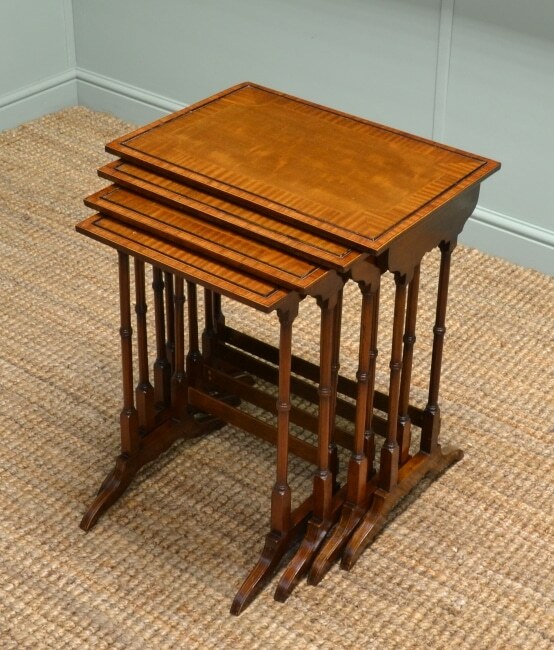 They were made by renowned makers such as Maple & Co and Waring & Gillows of Lancaster with either three or four tables that nest together beautifully, each with a beautifully figured top sometimes inlaid with satinwood cross banding and boxwood string inlay, elegant turned upright supports and stand on splayed feet. An Edwardian Inlaid Mahogany Quartetto of Antique Tables. Here at Driscolls Antiques we get some really lovely examples for sale and if you visit our antique tables page you can see our full selection along with lots of other quality tables. Below is some lovely examples we have previously sold via our website and if you are looking for any similar to the examples below and we do not have any available please email us to join our wanted list, we can then locate some for you with no obligation to buy. 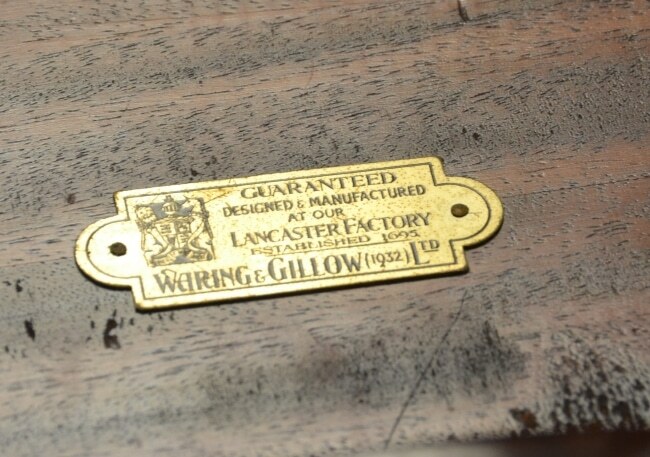 Quality Waring & Gillows Nest of Mahogany Antique Tables. 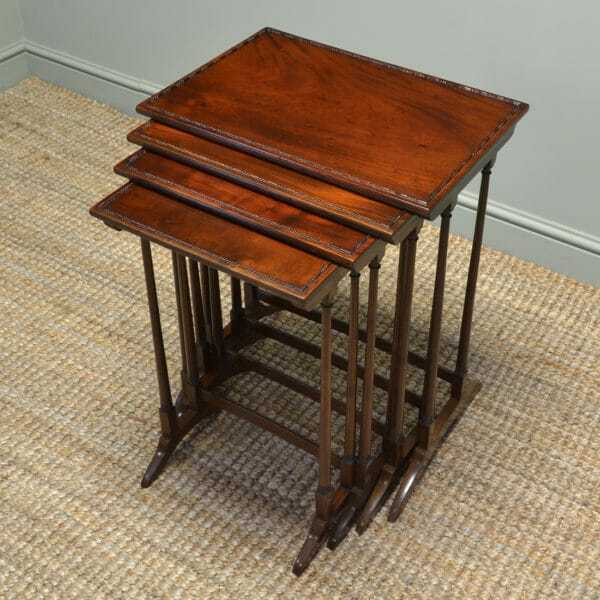 Dating from around 1930 this is a quality nest of antique tables made of mahogany by the renowned makers Waring & Gillows of Lancaster. 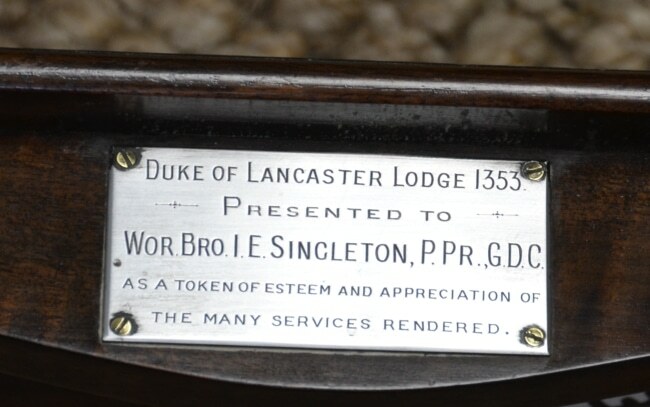 The set not only retains the original makers stamp but also a presentation badge on behalf of the Duke of Lancaster Masonic Lodge No. 1353 to an individual for services rendered. The set consists of three small occasional tables that neatly slot together when not in use. 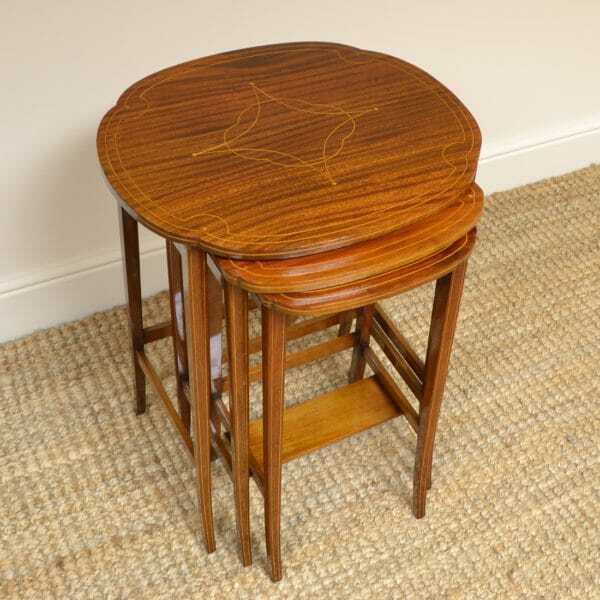 The tops are beautifully cross banded and stand on splayed legs, the smallest table has a central lower tier. These are of super quality, expected of a Gillows piece. 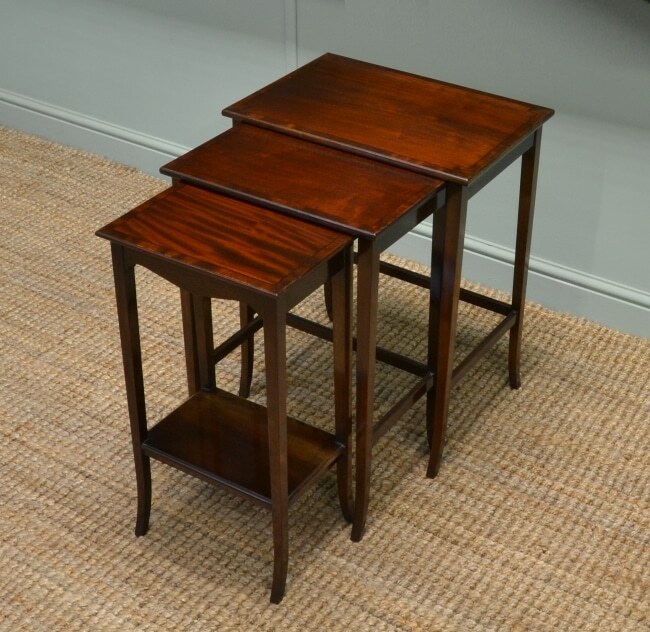 This superb quality antique set of four nesting tables has relatively tall proportions, is made from mahogany and dates from the Edwardian period, circa 1900. 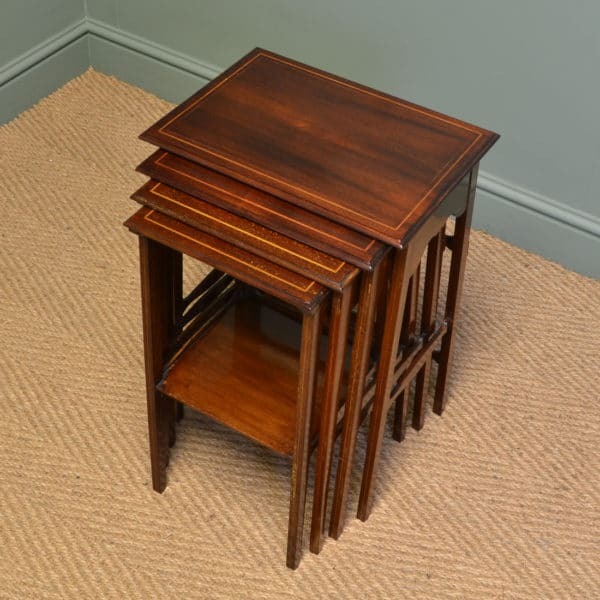 The four graduating tables nest well together when not in full use, each having a beautifully figured solid mahogany top with unusual moulded edges. They all have elegantly turned legs with splayed feet and a cross stretcher for added stability, they have also been stamped ‘G.L.’. 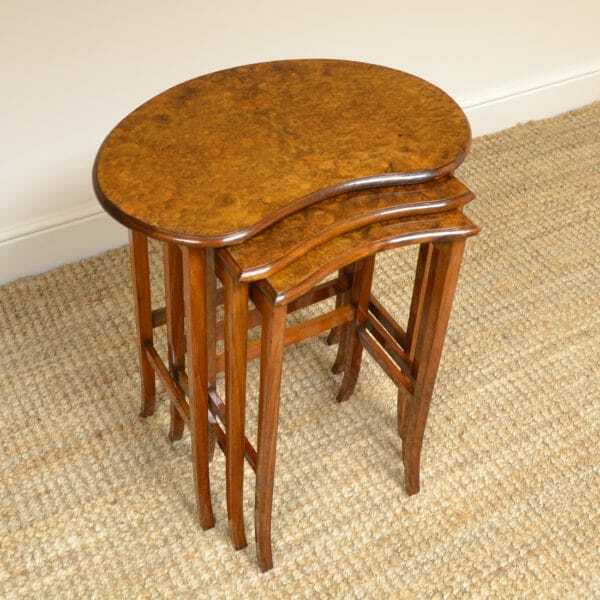 This beautiful antique nesting tables are a superb example of quality Edwardian furniture, the set of four being even more versatile than the usual set of three. 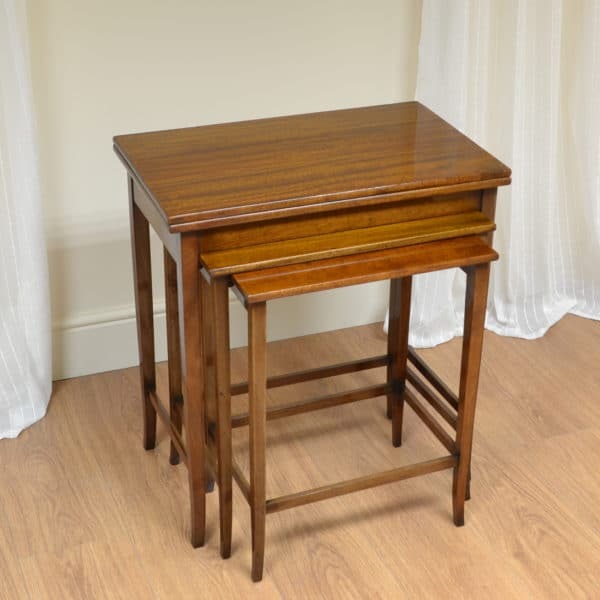 They have aged to a rich, medium dark shade of mahogany with a striking grain, good patina, is in very good condition and has been beautifully cleaned using a traditional form of wax finishing. Dating from around 1900 in the Edwardian period this nest of antique satinwood tables have been beautifully decorated. 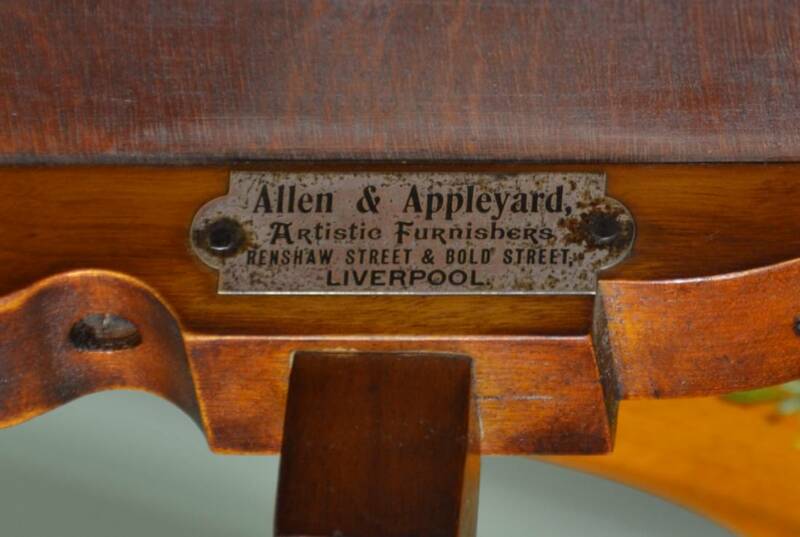 They still retain the furnishers label of “Allen & Appleyard” from Liverpool. All the tables have shaped moulded tops with decorative painted floral designs and stand on turned tapered supports. They rest on splayed legs which also display a delicately painted floral design. They are full of the charm and character from age and use and the satinwood is a lovely warm shade. 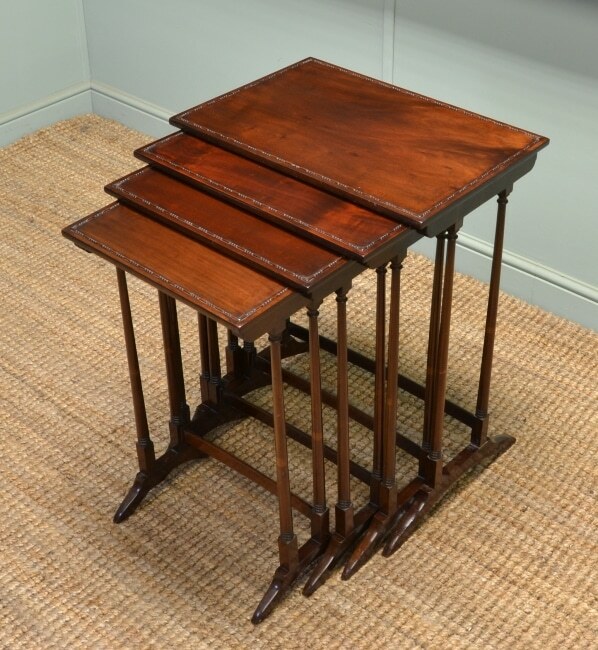 Dating from around 1900 in the Edwardian period these Antique Mahogany set of three tables nest together beautifully. 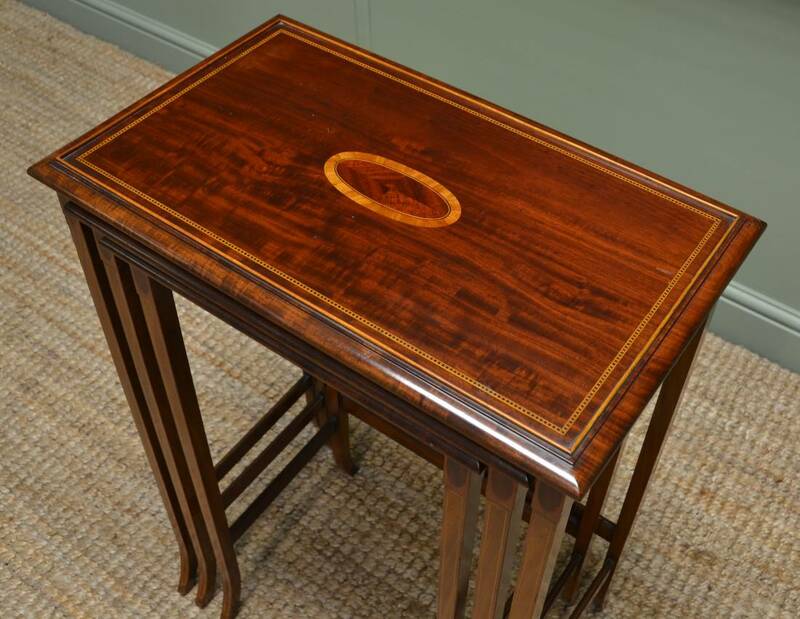 All three tables are beautifully figured with moulded edges and oval satinwood cross banding, they feature a boxwood and ebony string inlay and have a quarter veneered decorative central panel. These splendid tables stand on splayed legs and have a cross stretcher to provide extra stability. 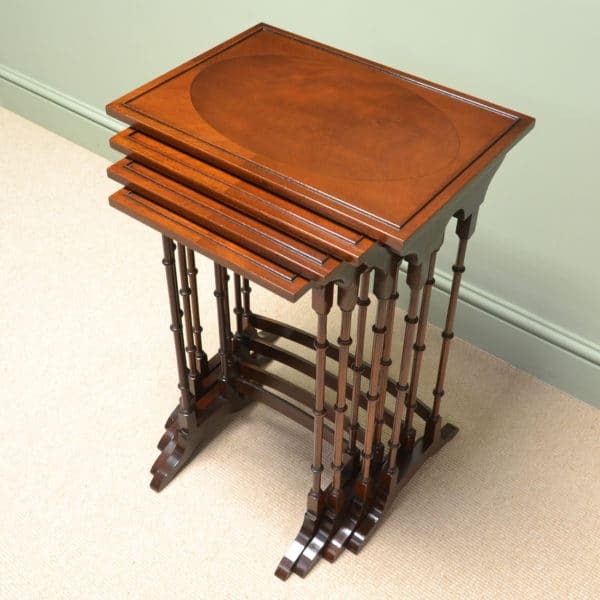 An Edwardian Inlaid Mahogany Quartetto of Antique Tables. 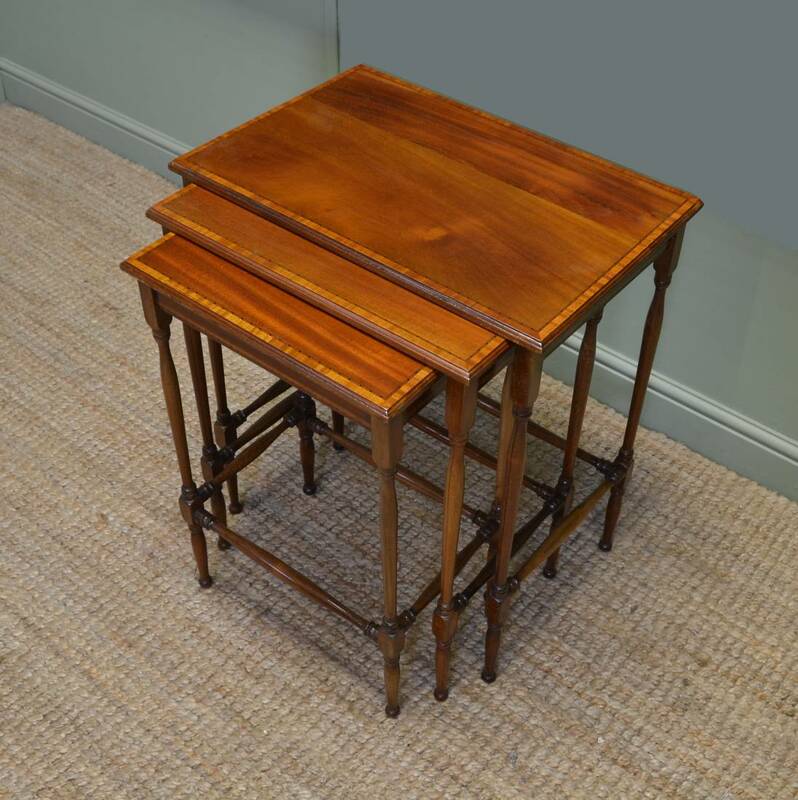 This beautiful set of four nesting antique tables date from around 1910 in the Edwardian period. The graduating design of these small occasional tables allows them to nest neatly away when not in use. They all have tops which are beautifully cross banded and have a small raised moulded beading along with boxwood and ebony string inlay. 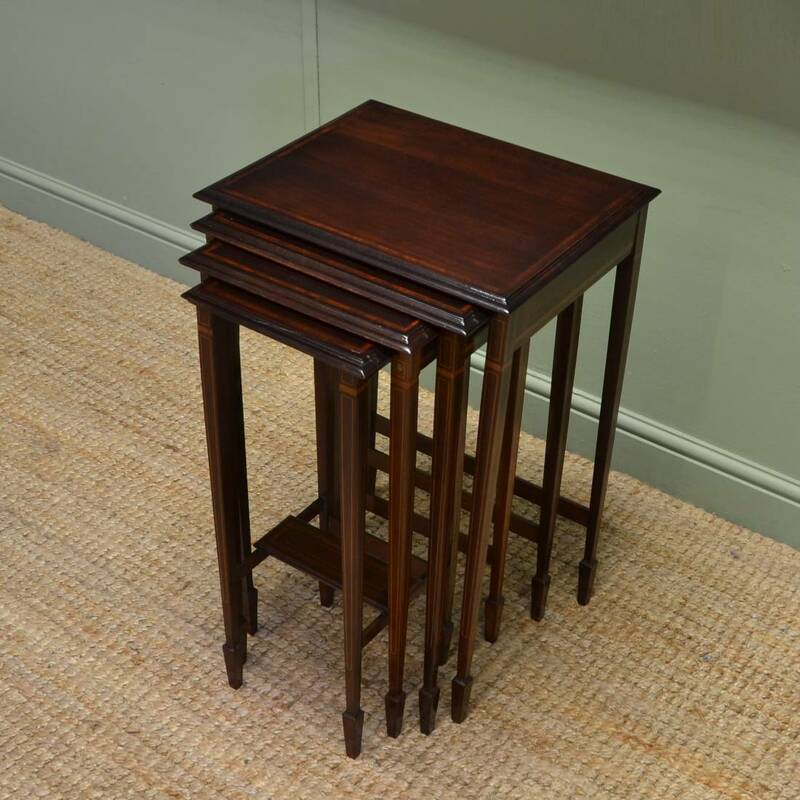 Each table has four finely turned upright supports and stands on splayed legs, again with boxwood string inlay. This antique quartetto of tables are an unusual find and have the benefit of being a gorgeous medium golden shade of mahogany. 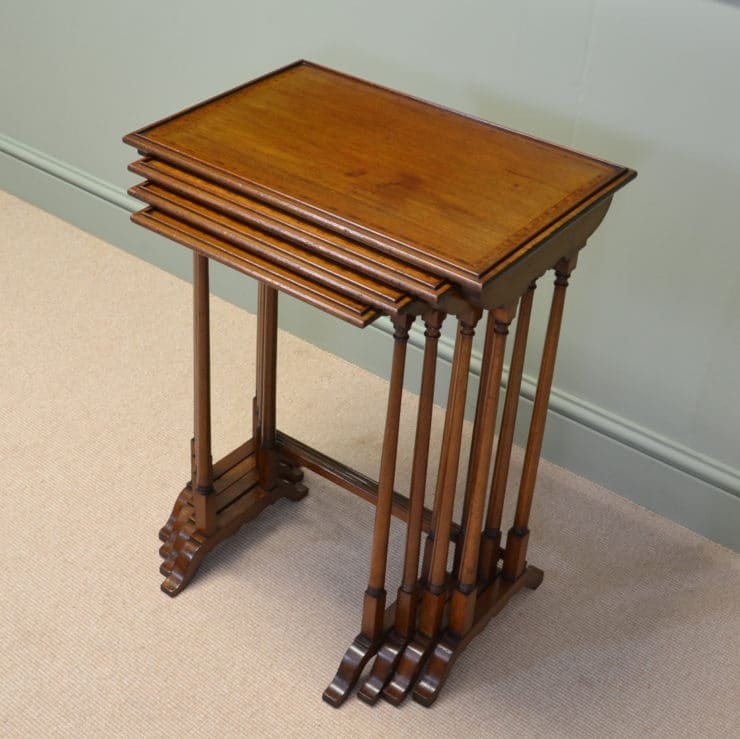 An Edwardian Mahogany Quartetto of Antique Tables. 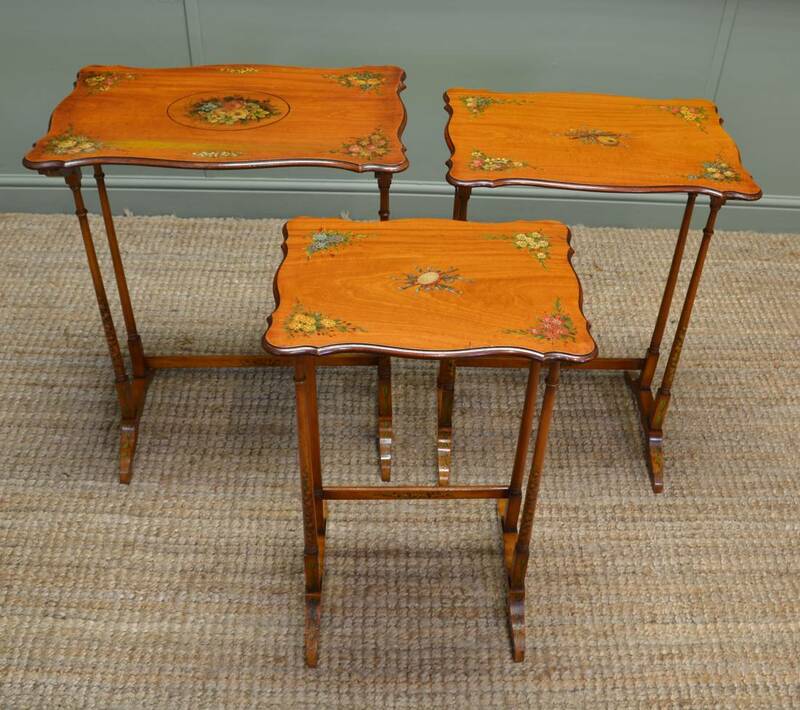 Fine Quality Edwardian nest of 3 Inlaid Antique Tables. Dating from the Edwardian period ca. 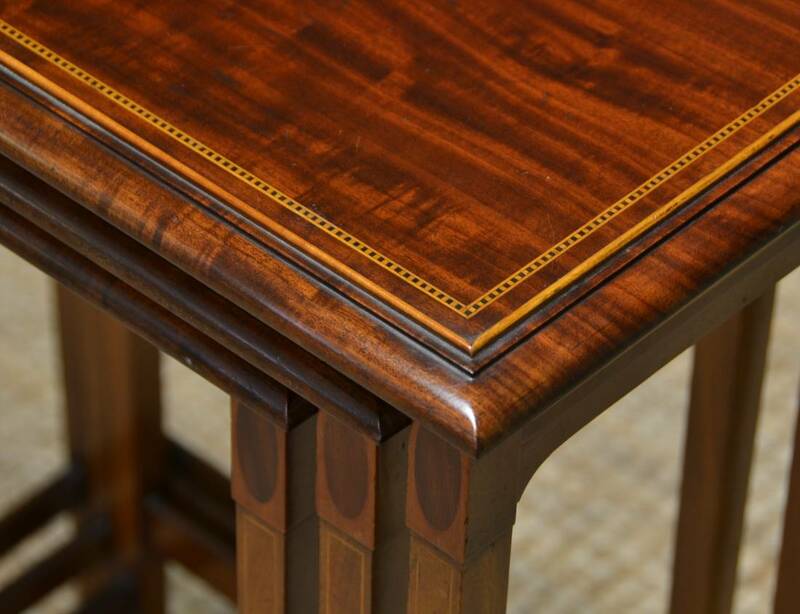 1900 this set of three inlaid mahogany tables nest together beautifully. 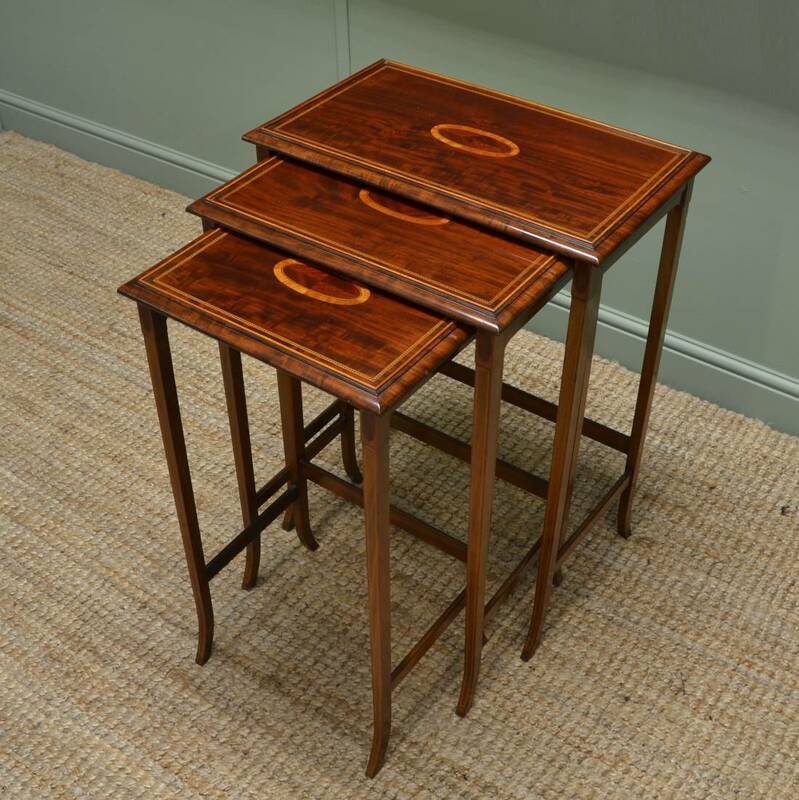 They each have a rectangular moulded top with striking satinwood cross banded edge and boxwood string inlay. Each table stands on beautifully turned legs with elegant cross stretchers providing added stability.